The main aim of this book is to present recent results concerning inequalities of the Jensen, Cebysev and Gruss type for continuous functions of bounded selfadjoint operators on complex Hilbert spaces. In the introductory chapter, the author portrays fundamental facts concerning bounded selfadjoint operators on complex Hilbert spaces. The generalized Schwarz’s inequality for positive selfadjoint operators as well as some results for the spectrum of this class of operators are presented. This text introduces the reader to the fundamental results for polynomials in a linear operator, continuous functions of selfadjoint operators as well as the step functions of selfadjoint operators. The spectral decomposition for this class of operators, which play a central role in the rest of the book and its consequences are introduced. At the end of the chapter, some classical operator inequalities are presented as well. Recent new results that deal with different aspects of the famous Jensen operator inequality are explored through the second chapter. 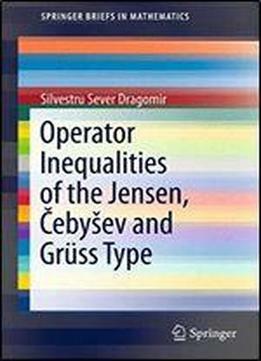 These include but are not limited to the operator version of the Dragomir-Ionescu inequality, the Slater type inequalities for operators and its inverses, Jensen’s inequality for twice differentiable functions whose second derivatives satisfy some upper and lower bound conditions and Jensen’s type inequalities for log-convex functions. Hermite-Hadamard’s type inequalities for convex functions and the corresponding results for operator convex functions are also presented. The Cebysev, (Chebyshev) inequality that compares the integral/discrete mean of the product with the product of the integral/discrete means is famous in the literature devoted to Mathematical Inequalities. The sister inequality due to Gruss which provides error bounds for the magnitude of the difference between the integral mean of the product and the product of the integral means has also attracted much interest since it has been discovered in 1935 with more than 200 papers published so far. The last part of the book is devoted to the operator versions of these famous results for continuous functions of selfadjoint operators on complex Hilbert spaces. Various particular cases of interest and related results are presented as well. This book is intended for use by both researchers in various fields of Linear Operator Theory and Mathematical Inequalities, domains which have grown exponentially in the last decade, as well as by postgraduate students and scientists applying inequalities in their specific areas.